As I have not played poker full time yet, I realize that my initial attempts at playing are mostly at level 1 and occasionally at level 2. So what I get from all of this is that I need to work on moving up to the next level of thinking in order to improve my playing and my profitability. This is easier said than done and it goes back to discipline and to practice. Currently my game of choice is Limit Holdem at low stakes, no higher than $5/$10. Right now, I am playing $2/$4 while trying to improve my game and the idea of levels of thinking is helpful. Just playing at level one thinking can be costly. At that level of thinking, if I have pocket Aces, I bet and raise and re-raise without considering what my opponent might have. 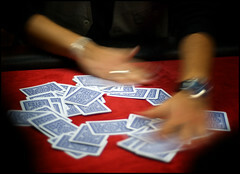 Pre-flop, pocket Aces are the winning or tying hand. After the flop, it could be anybody’s guess as to how good the pocket Aces are. If you are not thinking about what your opponent has after the flop and how it compares to your hand, you might be fighting a loosing battle. And that is where level two thinking comes in. If you can figure out the possible type of hands your opponent has, you can decide to just call, raise, or even fold your hand. Level three is a little trickier, and involves trying to figure out what your opponent thinks you have. The reason this is important is because he may basing your hand on how you have played prior hands. He may have noticed that once you have any kind of a hand you don’t give it up. He may have seen your hands at showdown time, when you played your AA or AK right to the end, to the river, without regards to what has flopped, turned, or rivered and have seen that you have lost those type of hands when the opponent has two pair, three of a kind, a straight or a flush. If you know how your opponent plays and you can play differently than he thinks you are playing, you can gain an advantage over him. That is a lot to think about. I will try to get stronger at level 2 and level 3 thinking and continue to learn and work at getting to level 4 while working at mastering the first three levels. This entry was posted in HowTo, Lessons, Poker. Bookmark the permalink. I think sometimes these pros keep pushing ideas out there so people like us can continue to think about it. Its like one big mind game for them! What about a Level 5? “What does my opponent think that I think I might possibly think that they have?”LOL! I do agree though. You have really have to get an idea on what your opponent has. Its sometimes tough online versus live play, but any tips are huge. Well poker has a bit of a mind game in it anyway. But I couldn't agree more that if you do know what your opponent has and know what he's thinking that you have you can manipulate the game to your advantage.